Picture framing has always been a passion with us and we pride ourselves in offering the largest in-stock selection of frame choices from the finest to the most affordable. 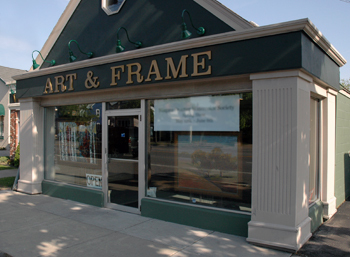 Vern Stein Art and Frame opened for business in May of 1987 as a small gallery offering custom picture framing along with an extensive selection of antique paintings and prints. Within one year, our success prompted a move to our present location at 5747 Main St. Now, 23 years later, we have doubled the size of our gallery and we have expanded our collection to include a vast selection of all mediums and styles of artwork from traditional to contemporary. Picture framing has always been a passion with us and we pride ourselves in offering the largest in-stock selection of frame choices that include the finest hand-finished Italian moulding to the most affordable moulding for the budget-conscious. Our staff has been with us for 20 years and counting and we are able to offer a level of industry experience that allows us to tackle a project of any size or degree of difficulty. RELY ON OUR PROFESSIONAL PICTURE FRAMING & CONSULTATION SERVICES! Along with our in-house staff, we are pleased to offer outside art consultation services that include residential and corporate sites which give our clients the benefit of a trained eye to assess their space and make the appropriate suggestion for type and size of artwork best suited for their location. We encourage our clients to “test-drive” the artwork in their homes for a few days to fully appreciate the beauty of the piece before buying and our installation staff completes the picture by delivering and hanging your purchase.